On that first day in June, I stood in a Budapest train station with half a dozen people I didn’t know, wondering if I had the skills or stamina to help. A few weeks later, I woke up with 15 Afghanis in my flat, then accompanied them to the immigration office to obtain documents they needed. My worries were gone. I was part of what had become a national network of volunteers helping refugees in Hungary. My work and others’ showed the difference between official policies and the sentiments of many ordinary Hungarians. The government launched its campaign against foreigners in June, putting up posters in Hungarian with claims like, “If you come to Hungary, you cannot take the jobs of Hungarians!” To many of us, those messages seemed somewhat surreal. No surprise that the reaction was a series of satirical crowd-funded billboards saying things like “Come to Hungary, we’ve got jobs in London”—referring to the massive flow of young Hungarians to Western Europe in recent years. It seemed not worth the effort to engage the government’s position seriously. The government, it seemed, would rather spend time and effort on unwelcoming signs than address a crisis that it foresaw coming. Citizens, meanwhile, were busy trying to help. It started in June, when hundreds of refugees arrived in Szeged, a southern city close to the Serbian-Hungarian border. They were registered by both the police and the Office of Immigration and Nationality before being dropped off at the city’s train station. All they received from the authorities was a piece of paper in Hungarian assigning them to a particular refugee camp. Full stop. Once fellow passengers—Hungarian commuters—realized that these people had absolutely no clue what to do and how to do it, they began to organize assistance. In a few days, it was all over the news: Ordinary citizens explained documents, gave directions to the refugees, offered them food and water, arranged medical care, and helped find legal aid for those who required it. With each passing day, there were more and more people coming to help—and more and more people looking for help. Soon, just giving out food and water seemed insufficient. I had to get to know my way around the maze of the immigration office. Hundreds of families had been separated, and thanks to the mess during the registration process, some unaccompanied minors were sent with complete strangers to refugee camps and other people lacked proper registration and couldn’t enter the camps. 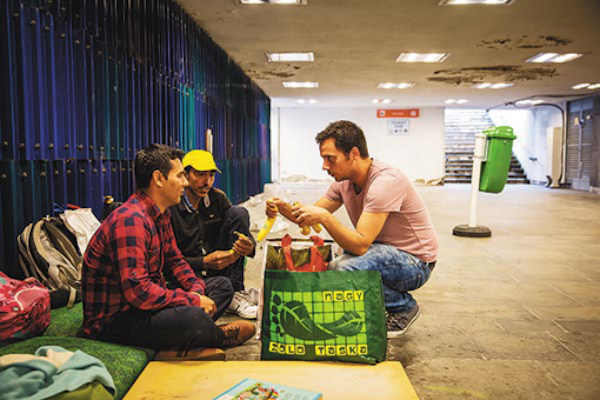 It was up to the volunteers to solve these issues, with the only external help coming from the Hungarian Helsinki Committee, an NGO that provides free legal assistance to refugees. Meanwhile, many of us hosted people in our apartments if they needed some rest or simply wanted to have a shower after weeks of walking hundreds of miles in the heat. A volunteer offered the community space she was running to host refugees for a night while others opened their offices downtown to families who were unable to pay for a hotel. I don’t drive, but many volunteers do: people started giving lifts to disabled people and families with toddlers. Volunteering doctors treated people on the pavement. 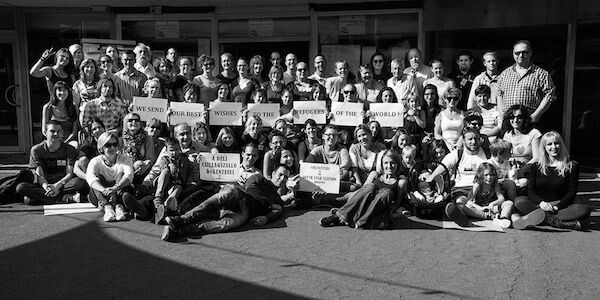 A group of volunteers the author coordinated at a train station in Budapest. The government kept to its surreal script: It talked about the risk of epidemic (during the months I spent with refugees I only managed to catch a terrible cold) and the aggressive behavior of those seeking help (yes, sometimes people lost their patience—for example when more than 2000 people were put into a camp with a capacity for 800). We couldn’t care less: By the beginning of August, a national network of volunteers was sharing information and donations via a secret Facebook group—secret to avoid leaking sensitive information to xenophobic organizations. The members of this secret group were the coordinators at each train station and some dispatchers who arranged things like accommodation and medical assistance. They helped to spread information to the larger pool of volunteers—for example, to tell volunteers in Budapest how many people would arrive on a particular train. They also helped plan for special needs—like a pregnant woman, soon to give birth to her daughter, who was arriving at a certain station at a certain time. This network also helped find lost persons and reunite families on a daily basis. Many families were torn apart at the border and were sent to different registration points and different camps. Volunteers noted personal data, took pictures, and uploaded the data to this group. Usually within a few hours, volunteers at one of the other stations either spotted the lost relatives or remembered seeing them. Looking back, it’s hard to believe that a few dozen people who never knew each other managed to create and sustain such a system without prior experience, proper funding, or institutional background. What we had was trust in each other, an illustration of what people talk about when they talk in the abstract about “civil society.” Against all odds, the summer in Hungary turned into a mesmerizing experience for refugees and volunteers alike instead of a terrible humanitarian catastrophe. What kept all the volunteers going was the emotional reward of our work. I remember putting an Afghan toddler to sleep in my arms one night while singing a well-known Hungarian lullaby that begins, “The heart sleeps, and fear sleeps in the heart.” I remember a volunteer organizing a makeshift racing game for refugee kids riding plastic motorbike imitations. To avoid accidently hitting someone with a ball, we played with balloons. At one point, high school students showed up to talk and draw with the children. The station turned into a noisy playground. In a sense, none of us were altruists. We felt responsibility towards those that the state abandoned, but what urged us to show up the next day was the incomparable joy the work gave us. Hopefully, outsiders who saw these events managed to see the human faces of those that the government was so keen to portray as an indistinguishable mass of aggressive strangers spreading unknown diseases. Since September 15, new Hungarian regulations have come into force: Asylum seekers are either expelled from Hungary in a few hours at the transit zones near the Serbian border or kept in detention facilities if they crossed illegally. Those entering from Croatia were transported in closed carriages to Austria until the border was closed there as well on October 16. During the summer, the situation on the ground changed rapidly and so did the regulations. Until it made sense, volunteers were there to help. If help is needed, people will provide it again. For now, the train stations in Budapest have gone back to normal, filled with dirt and complaints about delays. Most volunteers, too, have gone back to normal life. What remains is an incredibly liberating realization: In the face of state-sponsored inhumanity, you always have a choice not to remain indifferent. András Léderer is a former politician who currently works for the Hungarian Helsinki Committee. A scholar of conflict resolution, he focuses his research on the possibility of communication in traumatized post-conflict situations. *Photos courtesy of András Léderer.